Sorrento - The Amalfi Coast - Pompeii - Naples - Rome - Florence - Tuscany - Venice...anywhere in Italy! No one knows Sorrento better than a native, so let me show you this beautiful town on Italy's southern coast where I have lived all my life! I can take you to the beautiful hidden spots in one of Italy's most beloved stretches of coast. My specialty is week-long driving tours of the most breathtaking and famous cities in Italy. You can relax while I take care of the driving and logistics, helping your choose the best hotels, restaurants, and sights so you have a stress-free vacation. Your transfer driver is the first person you meet when you set foot in a new country, so I make sure you immediately feel at home in Italy! My transfer service combines the reliability you need with the warm welcome you deserve. More than just your driver! I've been welcoming travelers to the Amalfi Coast since I was 12 years old, when I took my first job as a waiter in one of the most famous restaurants in Positano. Every morning, I would take the 7:30 bus from Sorrento, and come home on the last bus at 11:30 at night. I loved every minute...not for the paycheck, but for the opportunity to meet people from all over the world and learn about their countries and cultures. Still today, one of my greatest pleasures is making friends from across the globe and sharing with them the beauty of my country! My tours and transfers are a blend of professional precision and reliability and the warm human touch that makes our time together so unforgettable. 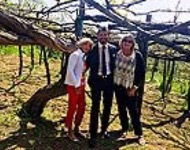 They've traveled across the world to discover Italy, and I make sure that each client has the trip of a their dreams, full of memories to last a lifetime. Make the most of your time on vacation and add a visit to the Pompeii archaeological site to your Naples - Sorrento (or vice versa) transfer...a unique opportunity to combine the comfort of a private transfer with the beauty of the most famous archaeological site in the world! Before setting off on your transfer to the Amalfi Coast from Naples, enjoy a tour of this vibrant city by car and sample authentic Neapolitan pizza! Culture, cuisine, and convenience with this transfer from the airport, station, or hotel in Naples to Positano, Amalfi, or Ravello (or vice versa). 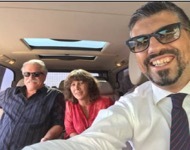 Book our deluxe Rome-Positano (or vice versa) transfer and reach the Amalfi Coast stress-free by luxury sedan or minivan with wifi, an English-speaking driver, and all the convenience and comfort you could dream of! Spend an unforgettable day exploring the most beautiful locations on the Amalfi Coast! Settle in and relax in one of our luxury sedans or minivans and let our bilingual drives take you on a private driving tour or shore excursion to Positano, Amalfi, and Ravello. Discover the magic of the coast! Visit the most famous ruins in the world via luxury car with English-speaking driver. Departures from Positano, Naples, and Sorrento. Don't miss this opportunity to combine history and cuisine in one incredible day! Take a trip through time by visiting Pompeii and then relax at a nearby winery to sample local specialties and one of the 15 DOC wines produced in Campania, followed by a glass of Limoncello!